1870 The family moved to Wentworth Woodhouse, Yorkshire in when his father was appointed farm bailiff. Herbert Austin first went to the village school, later continuing his education at Rotherham Grammar School. 1884 He emigrated to Australia, with an uncle, on his mother's side, who lived in Melbourne, Australia, but had recently returned to England on a family visit. They travelled to Australia by ship, via the Cape. He initially started work with his uncle, who was Works Manager at a general engineering firm, Mephan Ferguson (some reports say Richard Parks), in north Melbourne. After two years he left and joined another company, called Cowen, who were agents for printing equipment and Crossley gas engines. After that he worked for Langlands Foundry Co in Melbourne, which made locomotive boilers and wheels and mining equipment for gold mining. He also attended Hothan Art School in Melbourne, to continue his interest in drawing. During this time he submitted a design for a swing bridge over the Yarra River, at Spencer Street, Melbourne, but did not win the competition organised by the Government of Victoria. 1887 He met and married his wife, Helen Dron, in Melbourne. She was born in Melbourne, the seventh daughter of Scottish parents. Herbert and Helen were married on 26 December 1887 and bought a house in Melbourne. They had a son Vernon and two daughters, Irene (born in 1891) and Zoe (later to become Mrs Lambert). Three days before they were married he left the Longlands Foundry Co, to work as manager of an engineering workshop, owned by Richard Pick-up Parks, who had developed a new sheep-shearing machine for Frederick York Wolseley. 1887 After spending three months improving the sheep-shearing machine, Herbert Austin was asked to join the Wolseley Sheep Shearing Machine Co, founded in 1887, in Sydney. Shortly after joining he was sent to a sheep shearing station at Avoca on the New South Wales / Victoria border to study the machines in use. Austin had patented the improvements he had made to the sheep shearing machines in his own name, but sold the patents to the Wolseley Sheep Shearing Machine Co on 10 March 1893 in exchanges for shares. 1893 He returned to England by ship, with Frederick Wolseley, docking at Tilbury in November. Wolseley, had closed down the Sydney-based company and transferred it to a company registered in London and then set up a factory in Broad Street, Birmingham, where Austin became Manager. 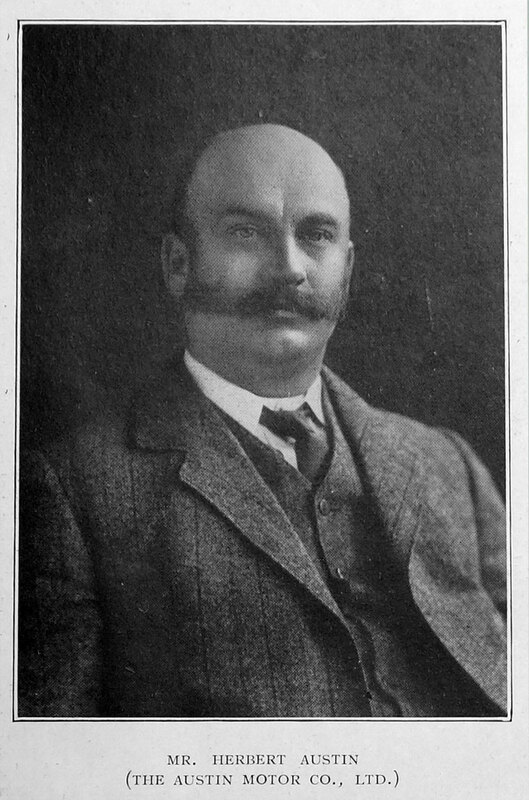 1894 Fredrick Wolseley resigned from the company. The Broad Street factory was not large enough so Austin bought a bigger one in Aston, Birmingham. During slack periods in the year they built bicycles. 1900 Letter from Birmingham. Manager of the S. S. M. Co. In 1905 Austin resigned from the Wolseley Tool and Motor Car Co taking some of the senior staff with him to form Austin. His brother Harry Austin also joined him in this new venture, having worked with him at Wolseley in Birmingham. Austin raised capital of £37,000 and embarked on a search of a factory that could accommodate his idea for a new car manufacturer. He took over an old print works, outside Birmingham, in Longbridge. He was Chairman of the Board of the Wolseley Sheep Shearing Machine Co from 1911 to 1933. In 1917, he was knighted for his services to the war effort and received the Belgium Order of the Crown of Leopold II, for the employment of 3,000 Belgium refugees at Longbridge. His landmark designs helped battle Germany in both world wars from fighter aeroplanes to tank tracks built at his Longbridge works, he was also famous for the Austin Seven designed at his home, Lickey Grange, which helped Austin become Britain's biggest motor manufacturer in 1934, and the 12/4. In 1937 he received a Doctor of Laws (LL.D) from the University of Birmingham. 1941 May 23rd. He died at his home Lickey Grange, near Bromsgrove from a heart attack and a bout of pneumonia. Lord Austin, who died in May this year, was born at Little Missenden, Buckinghamshire, on November 8,1866. In 1884 he went to Australia, where he joined the Wolseley Sheep-Shearing Machine Co., Ltd.
As manager of the company he returned to this country in 1893 to supervise the production of machines in Birmingham. Under his management the Company began to manufacture bicycle and small machine parts, and soon Austin was designing and producing small cars. In 1901 a new company, the Wolseley Tool and Motor Car Co., Ltd., was formed with Austin as general manager, and he was now able to devote all his energies to the new industry. The Austin Motor Co., Ltd., was founded in 1905 at Longbridge, and Austin was now his own master. The firm developed rapidly under his inventive genius and in 1914-1918 was turned over entirely to war work for which Austin received the K.B.E. After the war the Company returned to motor cars and, with the introduction of the "Baby Austin," became one of the largest motor-car concerns in the country. Lord Austin always took considerable interest in the welfare of his countrymen, and of his own city in particular. He was a Member of Parliament from 1919 to 1925, was created Baron in 1936, and had held all the highest offices in the motor trade, besides receiving honours from many engineering societies. He was elected a member of the Institute of Metals in 1928. "...Lord Austin of Longbridge, the founder and chairman of the Austin Motor Company, Ltd., of Longbridge, Birmingham, which took place at his home, Lickey Grange, near Bromsgrove, on Friday, May 23rd, the British motor industry has lost a pioneer worker and an outstanding and vigorous leader. Lord Austin was born at Little Missenden, Buckingham hire, on November 8th, 1866. He received his education at Rotherham Grammar School and Brampton College, and in 1884 he went with an uncle to Australia. He..."[More]. THE RT. HON. LORD AUSTIN OF LONGBRIDGE, K.B.E., LL.D., was born at Little Missenden, Bucks, in 1866, and was educated at Brampton College and Rotherham Grammar School. In 1882 he went to Australia, where he served his apprenticeship with the Longlands Foundry Company, and with Messrs. Richard Parks and Company in Melbourne he also attended classes on technical subjects at the Municipal School. Subsequently he became works manager to Messrs. Richard Parks, and later engineer to Mr. Wolseley, who was developing a machine to shear sheep. He returned to England in 1893 and became manager of the Wolseley Sheep-Shearing Machine Company in Birmingham, and from 1901 to 1905 he held a similar position with the reorganized firm of the Wolseley Tool and Motor Car Company, Ltd. In 1905 he had already founded the Austin Motor Company, Ltd., and was chairman and director of that firm up to the time of his death, which occurred on 23rd May 1941. In 1922 he introduced the "Austin Seven" motor car on the market, which brought motoring within the reach of large numbers of people. During the war of 1914-18 the works at Longbridge were largely given up to the production of shells and other war material, and since the commencement of the present war the firm has devoted itself to the production of aeroplanes, aero-engines, and other munitions of war. Lord Austin's experience of the mass-production of motor cars enabled him to take much of the responsibility for the work of six "shadow" aircraft factories, and he was chairman of the Shadow Aero-Engine Committee during 1937-40. Lord Austin's many valuable services were recognized by the award of the K.B.E. in 1917; in 1936 he was created a baron, and the honorary degree of LL.D. was conferred on him by Birmingham University in the following year. In addition he was a Commander of the Order of Leopold II. 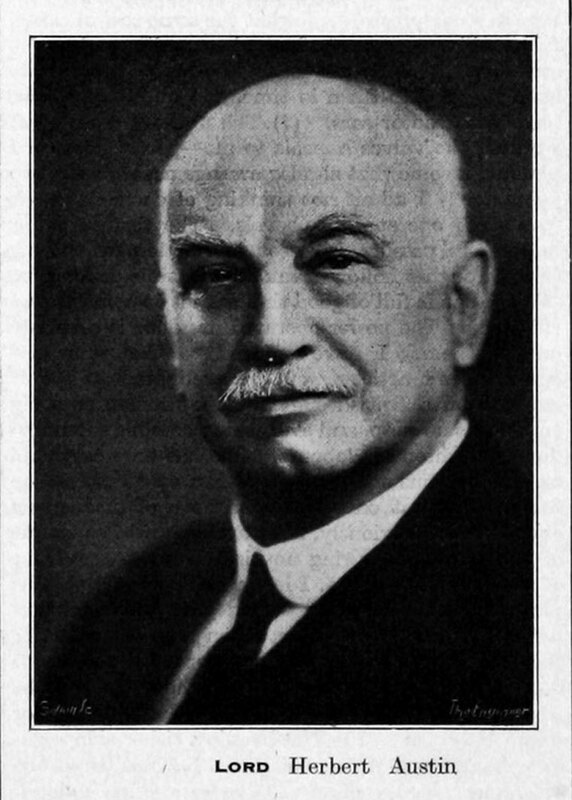 He was elected a Member of the Institution in 1918,and an Honorary Life Member in 1938; and he was a past-president of the Institution of Automobile Engineers, and president of the British Cast Iron Research Association. He was Unionist M.P. 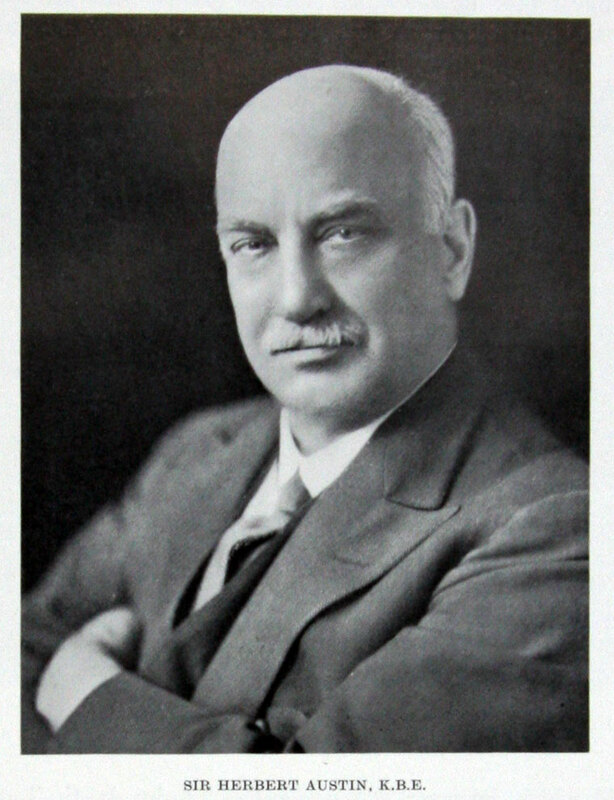 for King's Norton, Birmingham, from 1919 to 1924, and was president of the Society of Motor Manufacturers and Traders during 1934-5, and a former president of the Motor Trade Association. 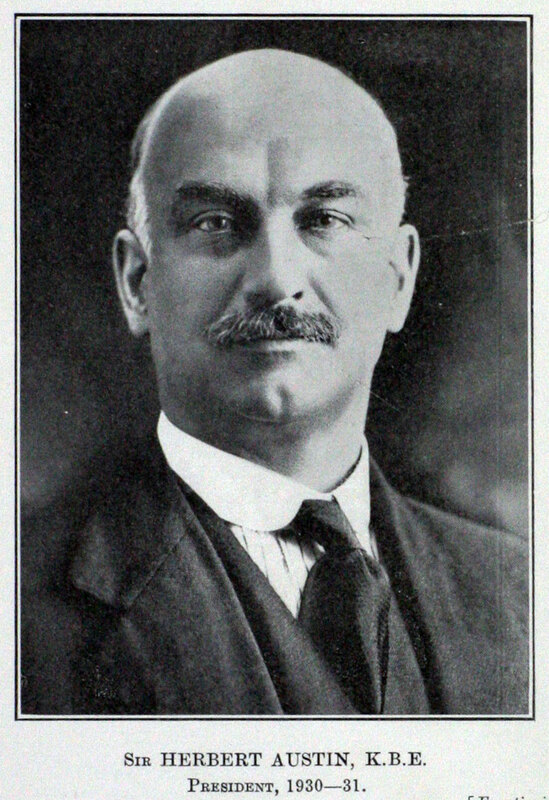 Lord Austin of Longbridge was born in 1866 and in 1884 went to Australia, where he obtained his engineering training. In 1893 he returned to England to act as the representative of the Wolseley Sheep Shearing Co., Ltd., of Melbourne. His first design for an automobile was completed in 1895, and after a period spent as General Manager of the Wolseley Tool and Motor Car Co., Ltd., he founded, in 5905, the Austin Motor Co., Ltd. He was created a K.B.E. in 1917 and a barony was conferred upon hint in 1936. He had been a member of the Cycle Engineers' Institute from its earliest days, and when the I.A.E. was established in London he became a Member of Council and was President for the Session 1930-31. He died on 23rd May, 1941, at the age of 75. Further details of his career were published in the Journal for August-September, 1941. This page was last edited on 30 November 2018, at 12:22.